Amazing anecdotes indeed, that are reminiscent of tonic immobility exhibited in sharks. *** When a shark like a lemon shark is turned on it back, it will remain in a state of paralysis for an average of fifteen minutes before it recovers. During tonic immobility, the dorsal fin(s) straighten, and both breathing and muscle contractions become more steady and relaxed. Other sharks like tiger sharks will go into tonic immobility when they are inverted, or stroked on the snout in the area around its eyes. They may even sink to the sea floor in their tonic state. Tonic immobility might not be a pleasant but rather a stressful experience for sharks. The specific origin or function of this reaction remains a source of speculation. Some believe its related to mating, when a bite of a male shark immobilizes the female and thus facilitates mating. It might also be a manifestation of an old evolutionary reflex called ‘thanatosis’ or apparent death: a defense mechanism that is found in a wide range of animals to deceive a predator in a situation of acute danger. My personal -I think more simple- explanation is that manipulations like inverting or stroking a shark disturb its sensory-spatial orientation system. For example, snout stroking could affect the Lorenzini cells that sharks use to locate their prey in the immediate environment, while they are sensing the surrounding electrical field. 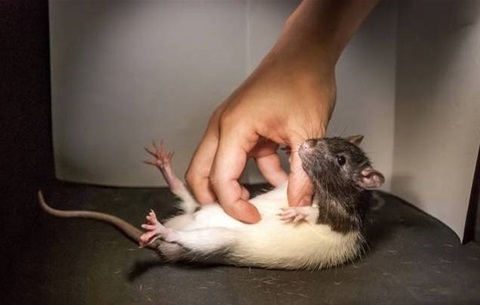 Stroking this hypersensitive area might not only lead to a ‘black out’ of its sensory environment, but also of its motor system, comparable to fainting in humans. 'Sensing' and 'moving' are closely related functions, seen from the perspective of the brain. But it cannot be excluded that stroking the nose of a shark also elicits a pleasant feeling, similar to tickling or stroking of a dog. Some video clips of tiger sharks at Tiger Beach, a famous location to meet tiger sharks in the Bahamas, suggest that certain tiger sharks once stroked on the nose return to the diver like its ''asking for more’’. This fits in the pattern that sharks -like dogs- tend to become familiar with and even recognize the regular bait providers.The only difference being that the tiger sharks favorite snack is a piece of tuna and not a cookie. Panksepp, J.; Burgdorf, J. (2003). "Laughing" rats and the evolutionary antecedents of human joy?"(PDF). Physiology & Behavior. 79 (3): 533–547. doi:10.1016/s0031-9384(03)00159-8.